Yoga classes for seniors are held at COTA NT in Spillett House every Wednesday (with the exception of instructor ‘away days’). 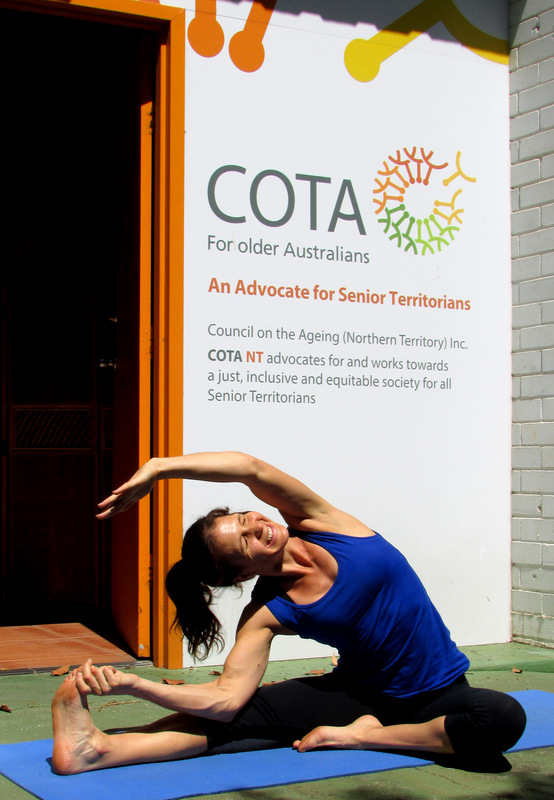 Yoga is part of our Fit for Life program, which encourages seniors to stay healthy, grow stronger and to improve their balance, flexibility and co-ordination. check with your doctor first before starting any exercise program (see About Yoga notes below). bring comfortable clothes and shoes, drink bottle and towel. Mats (foam not Yoga mats) are provided for this class (up to 20) and early arrival is advised. There are three key components to a good workout for seniors: low impact cardio, resistance training, and stretching. Whilst Yoga has the potential to cover all three of these bases, health experts recommend that people who are getting older should give serious thought to which yoga program they choose to adopt. Certain forms of yoga may be too strenuous, or require so much flexibility that a senior could easily hurt themselves by pushing too far.